U2 have never been shy about using biblical imagery. Doing so has been a foundational poetic device throughout their 35-year catalog. Scripture has, at times, simply nuanced lyrics (such as the New Testament idea of "agape love" in "I Will Follow"), while at others, it has been directly referenced (note the use of Revelation 6:12-13 in "Fire"). For more examples of biblical influences in their music, see @U2's page, Drawing Their Fish In The Sand. On the Innocence + Experience tour, Scripture has accented concert themes in both subtle and overt ways. At latest count, more than 35 different psalms have been referenced, spread out over multiple songs on any given night. The artistry and irony of a post-punk rock band featuring ancient religious poems in a state-of-the-art multimedia show is quite stunning, and worth a deeper look. First, a bit of context. The book of Psalms is really an anthology, a collection of songs that was used for Jewish religious rituals. Individual psalms were written and then gathered together over a number of centuries and essentially became a worship hymnal for the ancient Hebrews, beginning with King David and ending shortly after the people returned from Babylonian exile in the sixth century B.C. While much of the Bible is styled as narrative or instruction, psalms are unique because they are words addressed to God, rather than words from God, resulting in the most "human" book in Scripture. Psalms has been loved for millennia because people identify with the psalmist's expressions of joy, celebration and praise, as well as grief, lament and even doubt. Bono has a particular fondness for Psalms. In 1999 he penned the foreword to a new translation of the ancient collection, highlighting the temperament of King David and calling him one of the first blues artists. Bono writes, "Abandonment and displacement are the stuff of my favourite psalms. The Psalter may be a font of gospel music, but for me it's despair that the psalmist really reveals and the nature of his special relationship with God. Honesty, even to the point of anger." 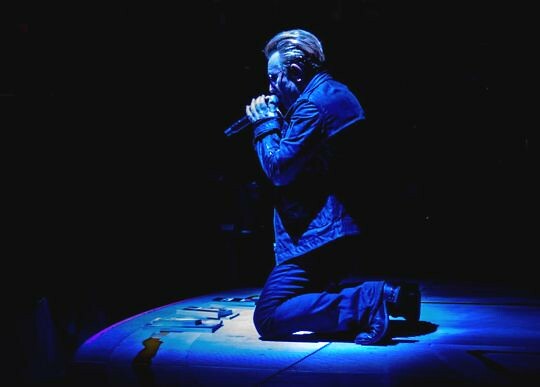 Rightly so, Bono identifies why we love the psalms and find them so relatable: "Words and music did for me what solid, even rigorous, religious argument could never do -- they introduced me to God, not belief in God, more an experiential sense of GOD." The ancient songs are filled with powerful emotion. These tunes were soundtracks of life 2,000-3,000 years ago, long before guitars, amplifiers and LED screens, but are still relevant. One of the phrases that's become a standard on the I+E tour is commonly found in the book of Psalms. "How long?" is a question that both the psalmist and U2 ask repeatedly. The lyric has its origin in multiple places. Psalm 13 uses the phrase to question God four times in the first two verses. Psalm 62 accuses God with, "How long will you assault me?" Psalm 89 reveals the poet's doubt, asking, "How long, Lord? Will you hide yourself forever?" Psalm 119 conveys the agony of someone tormented by enemies, pleading, "How long must your servant wait?" The "How long?" question gets picked up by U2 in numerous ways. In "Sunday Bloody Sunday," the first track on War and a staple of the I+E tour, in response to violence and injustice, we hear the cry, "How long must we sing this song?" Similarly, "40," the final track on War, echoes the same lament with, "How long, to sing this song?" But the phrase also finds its way into other U2 songs. Bono has been singing "how long" in "Out Of Control" his entire career. And during the song's bridge on July 22, at Madison Square Garden, Bono vamped, "How long, hooow looong?" to really drive the message home. Apart from the tour, the lyric also has a significant place in "The Saints Are Coming," a U2 cover performed with Green Day at the reopening of the Superdome, in response to Hurricane Katrina's devastation in 2005. 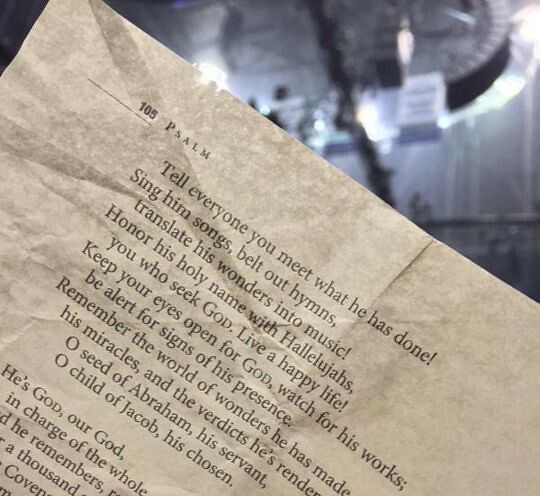 But the most prolific use of psalms on the I+E tour comes in the "confetti" drop, a prominent feature in the show, deeply connected to the movement from innocence to experience. The first "act" of the concert follows an important storyline, setting up the significance of the psalms release. It begins with U2 playing some of their best standard tunes on a simple stage reflecting a club-like environment from their early days, under a single bulb. While this opening group of songs varies a bit, the next set is fixed. "Iris" remembers the loss of Bono's mother, "Cedarwood Road" journeys through the band's old neighborhood and "Song For Someone" depicts a somber teenage Bono in his lonely house, struggling to find meaning and purpose after the death of his mother. Next, the concert reaches its darkest moment during "Sunday Bloody Sunday," with a brutal re-enactment of the 1974 Dublin bombings, by means of a stark white screen burst and earth-shaking sound effects. The story of the explosions continues with the raw and frighteningly gritty "Raised By Wolves." As the song concludes, victims' faces cascade down the giant screen accompanied by the caption, "JUSTICE FOR THE FORGOTTEN." The set reaches a climax during "Until The End Of The World," with Bono donning a MacPhisto-like persona and taunting Edge. Near the end of the song, the singer smashes the image of a light bulb, releasing a flood of waves across the screen, washing away the symbols of Cedarwood Road. Edge then lays into his final solo, while the MacPhistoesque character cackles and delights in the havoc he has wreaked, an allusion to the complete loss of innocence. Finally, debris from the explosion litters the arena as it falls from the ceiling. The combination of Bono's antics, Edge's howling solo, a cacophony of graphics and the falling confetti is overwhelming, creating a sense of hopelessness and despair for the human condition. But, just as it appears that evil has won and the has-been rocker MacPhisto has gained the upper hand, a counter message becomes evident for those who are watching closely. The litter falling from a window in the sky contains messages from Alice In Wonderland, Dante's Inferno and Psalms. To be precise, there are 27 different psalms contained on the many pages floating down from the ceiling, each a reprint of Eugene Peterson's contemporary paraphrase of Scripture, The Message. Not coincidentally, this is the same version Bono used on the Elevation tour when he introduced "Where The Streets Have No Name" with Psalm 116, reciting, "What can I give back to God for the blessings he's poured out on me?" All together now—applause for God! Say of God, "We've never seen anything like him!" can't stop enjoying your name and fame. Honor his holy name with Hallelujahs. While MacPhisto sought to pillage and disrupt creation in one last final deed, his malevolent act is redeemed with heavenly messages, a reminder that evil will be vindicated. Though innocence may appear to be lost, the harsh reality of experience is reimagined and made new. From there, the show uses either a video presentation of "The Wanderer" or Gavin Friday's cover of "The Fly" in a seamless transition to the high point, the brightest moment of the concert. Beginning with U2's veiled performance inside the video "wall," the entire concert hinges on a rich theatrical presentation of music, staging and lighting during the next song, "Invisible." As Bono sings through the second chorus, the band crescendos to a climactic cry of, "I am here!" at which point all graphics from the wall are removed, the screen becomes transparent, the dividing banners on the ends of the stage are raised and the crowd is washed in white light. The final challenge: "There is no them, there's only us." Figuratively, liberation and restoration are made complete. Literally, a wave of joy sweeps through the arena, culminating in the cheers and applause of audience members who may or may not be aware of the movement from innocence to experience that marks each and every one of us. The ancient psalms provide a core of material to complement the highs and the lows of such a grand and complex narrative. Filled with a spectrum of emotions, these ancient hymns carry both the grief of violence and the joy of redemption. And, on select nights, they show up in other U2 songs as well. In "Gloria" we get Psalm 51:15, "O Lord, open my lips, that my mouth may declare Your praise." "October" hints at Psalm 46:6, "Nations are in uproar, kingdoms fall; he lifts his voice, the earth melts." And, on that remarkable evening when they close with "40," U2 are actually giving us a combination of Psalms 6, 40 and 144. The Psalms abound in every concert on the I+E tour and they're an influence that might seem strange at first, especially to the nonreligious. But as disjointed as these ancient songs might appear, they are relevant and appropriate expressions of a band that has routinely used this body of material for inspiration throughout a nearly four-decade career. I was reminded of Psalms' enduring power again in a remarkable moment from the final show of the North American tour, when long after the band had put down their instruments, crowds streamed through the outer halls of Madison Square Garden, voices lifted in unison, repeating, "How long, to sing this song.... How long, to sing this song...."
Only U2 could get us singing a 3,000-year-old chorus while exiting an arena in communal chant, sending the tribe out with an ancient prayer on our lips. To quote Bono, "How punk is that?!" 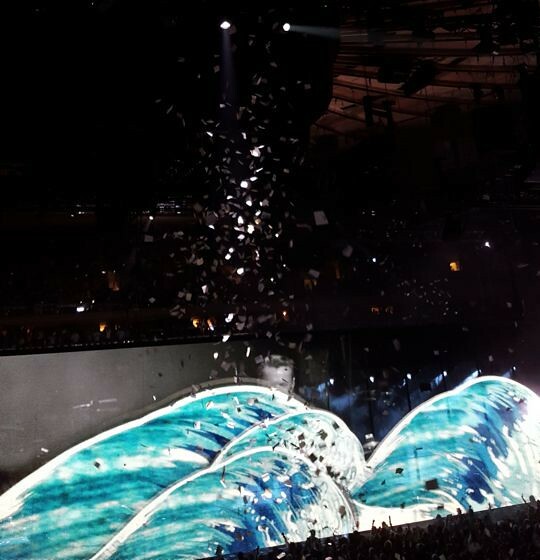 Many thanks to Christopher Jenkins and Aaron Sams at U2wanderer.org for their outstanding work in cataloging the psalms of the confetti drop, as well as other literature used throughout the tour.